I'm pretty sure I'm crazy. Let's just clear that up right now. But after so much fun last year, and numerous requests this year I'm doing it again. If I have to stay up a few nights with no sleep, it won't kill me, right? 2. Be willing to send an ornament of aprox. $10 value to your partner. They can be handmade, store bought, Etsy bought, whatever. 3. Email me (joshandbeki AT yahoo.com)with your name, address, and blog link. Please put Ornament Exchange in the title of your email! This is the most important step. 5. Ornaments will need to be mailed by Nov. 23 at the LATEST. 6. Spread the word, if you'd like. We also have a flickr group you can participate in. Just copy and paste the following code into your blog or website. *Please note that this is for fun only. I am not responsible for non-shippers, but hopefully we won't have any. The gorgeous logo was created by the incredibly talented Cathe Holden at JustSomethingIMade. Thank you Cathe!! Thanks so much for hosting this! I blogged and signed up. I can't wait! GENIUS!! I am giving signing up Serious consideration!! An ornament exchange, huh? I'd sign up for it, but frankly, I can't be trusted. Good intentions, bad follow-through. Yup, that's me. Ruth, that's the risk you take. ;-) Are you willing to gamble?! I dare ya. Double dog dare you. PEER PRESSURE!! ... ok, i'm in. no promises it'll be classy. Beki- it was so fun last year- thanks for hosting it again! and Ruth I wrote a little something about who I got last year... it's set to post this saturday- you'll see anything goes! 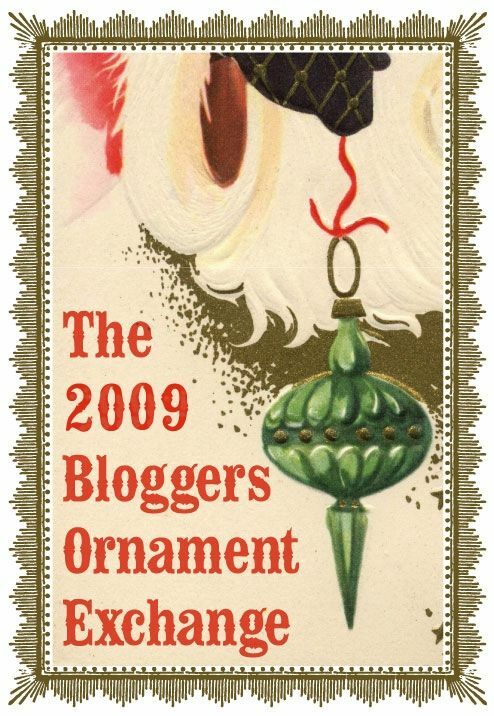 I am very excited about this: getting an awesome ornament AND meeting a new friend from across the country. Sounds like a win-win! This seems like so much fun I can't wait to participate! Okay, it's reopened. Sorry, I didn't know it would close automatically! fabulous idea....just what I needed to get into the holiday mode. I signed up! This is so cool - thank you for sponsoring this!! Here goes my first exchange! Thank you for hosting. Hurray! I signed up and am going to put up a link on my blog :) This looks like so much fun! I am so laughing right now. I would love to join in, but after I read that you were crazy...cuz I just posted that I am!...I expected maybe 30 people...then I saw the list....girlfriend, just remember, there are good things about a padded room! Good luck and good for you! Ooo! What a way to bring in the holiday spirit. Thanks for doing it! I've registered and blogged. Now off to create! love love love this idea..i was eyeing ornaments today and now i have an excuse to go buy one! Hi I tried to email you my info and it bounced back saying you didn't have a yahoo account. Please get back with me so I can get my info to you. Nice idea, lookign forward to that! Can't wait for the Christmas season. Thanks! Thanks for putting this in motion, what fun! I so LOVE this!!!! I have a friend who hosts an ornament exchange party every year...we bring a homemade ornament for every person and a pot luck dinner. Its so much fun! My girlfriend's and I used to do this. I miss it. So...yahooo - holly jolly fun once again! Thanks! What a delight! I will probably make something beauty filled with a vintage flair. Can't wait. Oh and when you figure out that thing about being stretched thin and having it translate to your jeans please let me know. Wow! Almost 200!!!! You're going to be busy pairing us up aren't you, Beki. Thank you so much for your time in making this fun for all of us. hi! can an overseas blogger like me join too? Would you prefer ornaments to hang on the tree, or ornaments as in decor for the Holiday season? and REALLY fun... the shmorgishborg of GREAT blog links to peek... more wheeeeee! The MckLinky list is closed...does that mean the rest of us can't participate????? Have the partners been assigned yet? I haven't seen anything about it yet. Thanks again for hosting the Ornament Swap, Beki. Looking forward to mailing mine out to my swap partner. La la la la la la la la la. Oh, I just saw this and I know its closed but any chance you can squeeze in one more? Have you sent out emails yet, partnering us up? I just want to make sure my email account doesn't think you're spam, cuz you're not! Would you mind dedicating a post on your blog when you do send out those emails. Thank you! oh, too bad I found you TOO LATE. Waaaa-aaaah!!! Oh well, maybe next year! Oh, I guess I'm too late...I just found you today 11/18...if I'm not too late then I would LOVE to join in...sounds like lots of FUN! Happy Thanksgiving! I had signed up a while ago and was still waiting for my person to be paired up with? did you already send out the names and I just missed it somehow? That sdound so much fun and I whiched I'd known about it before. Maybe next year? a lot of fun, thanks for hosting! I posted my gift.